Also you can try to use Test Payments. This method is used for test purpose only. At Payments Tab you can choose one of these methods and connect it to your account of payment system. 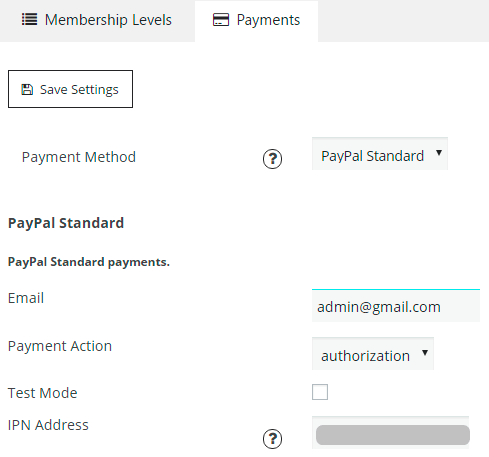 Copy and paste IPN Address to your PayPal Standard account to make IPN system work as it should. IPN Address – copy and paste this URL to your Authorize.net account as IPN address – to make IPN system work as it should. Check the instruction about correct filling these parameters. Choose Payment Action – authorization or sale. Check the tutorial about Creating and Managing API credentials, scroll down to paragraph about “Create an API signature”. Vendor account number – account number for the 2Checkout gateway. Secret word to validate response – get this from your 2Checkout account. This should be present here to validate responce from 2Checkout! Check the tutorial “Where do I set up the Secret Word?”. IPN Address – copy and paste this URL to your 2Checkout account in a Webhooks tab as IPN address – to make IPN system work as it should. Read more about “How to set up your notification URL(s) on the Webhooks tab”. Besides you can try 2Checkout payment method in Demo Mode. Demo mode allows you to test checkout process on a live payment server, but in this case will not be charged the payment from credit card. Copy and paste IPN Address URL to your Stripe account as IPN address – to make IPN system work as it should. Check the tutorial about Stripe Integration. Also such payment methods as Authorize.net, PayPal Standard, PayPal PRO, 2Checkout, Stripe you can try in a Test Mode. Such mode will redirect order submission on test payments servers.